Hi in this post we will see how to setup virtual host in Apache Tomcat server. 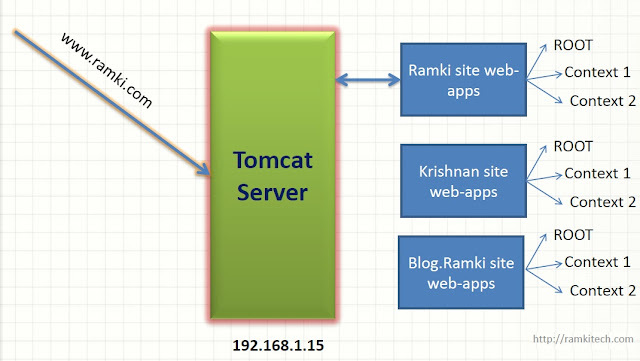 Virtual Host is in-built feature that allows to deploy multiple website(domains) in single instance of tomcat server. The main benefit in this way is its cost effective. The following diagram is my outline. Here my tomcat IP address 192.168.1.15. or any IP address allocated my ISP. but it should be public IP address. How all domain names are pointing to my Tomcat? Now How Setup Virtual Host Concept? Before going to setup the virtual host. first take look at the server.xml file in conf folder in tomcat directory. here <Engine> tag specified which engine is responsible for executing servlet. Here Catalina is the Engine. <Host> tag specify the domain name and web apps base location. here default domain name is localhost and web apps base location is webapps folder in tomcat directory. here name attribute to specify the domain name and appbase attribute to specify the location of domain specific web apps folder path. deploy the websites to respective web apps folder and start the tomcat. now open the browser and type http://www.ramki.com then its shows the ramk website content. Other two sites www.krishnan.com and www.blog.ramki.com works respective webapps. 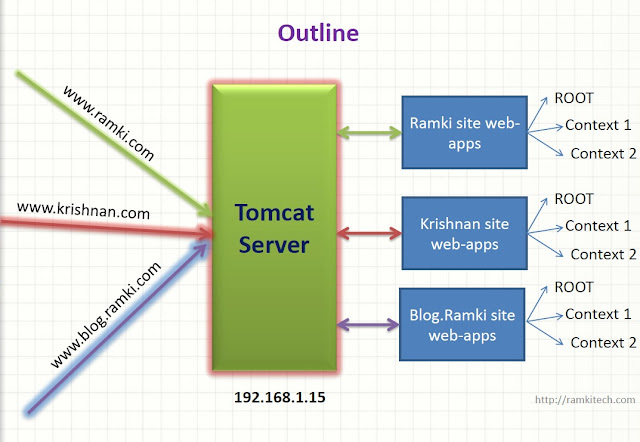 In above diagram represent when we access www.ramki.com the tomcat server consult with server.xml file and serves the files from ramki_webapps directory. The answer is based Host header field in HTTP request.